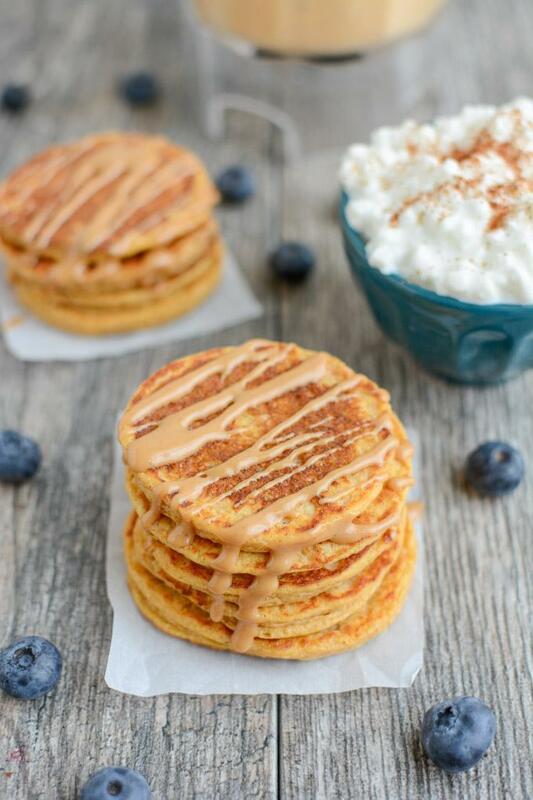 These Sweet Potato Protein Pancakes are made in a blender with protein-rich ingredients like cottage cheese and eggs. No protein powder required and they make a great breakfast or post workout snack. These Sweet Potato Protein Pancakes were born out of necessity a few years ago. I hadn’t gone grocery shopping the previous weekend and was looking for something quick and easy for lunch. I combined some leftover baked sweet potatoes with a little cottage cheese and a couple eggs and voila! A protein-packed pancake that requires no protein powder. Added bonus? You can whip them up in the blender making cleanup a breeze. A few things to note about these pancakes before we go any further. If you’re looking for fluffy, traditional pancakes, these are not them. There is no protein powder in these pancakes. They’re high in protein thanks to the other ingredients. Not everyone will like these. They’re a little dense in the middle so some people won’t like the texture. These do not taste like cottage cheese. A high protein, lower-carb breakfast option! Pour into a greased pan or griddle over medium heat. Let sit for 3-4 minutes before flipping. Flip carefully and let cook another 2-3 minutes. Flip again and let cook for 2 more minutes. Patience is the key when cooking these. Pour in the batter, let them sit for 4-5 minutes, flip them and let them sit for a few minutes. Then, flip them again and let them cook a little more. You can’t have your heat too high otherwise they will burn, but the longer cooking time helps them solidify a bit more in the middle. These dense, eggy pancakes continue to be a favorite of mine and both my kids love them as well! Enjoy these drizzled with nut butter or your favorite pancake topping. I often make a batch as part of my food prep and eat them cold throughout the week. They’re also great after a workout! Yum! This looks delicious. I love using sweet potato and butternut squash in place of flour. It’s so much more filling. I’m down with wet/slightly undercooked pancakes, so I’ll definitely have to make these! 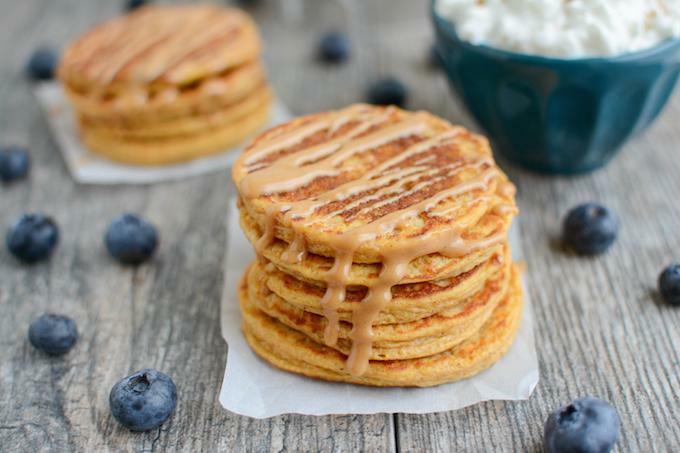 I like sweet potatoes so I think I will like these pancakes! I will give them a try! you’re so creative with your recipes! I love high protein recipes without protein powder! Winning buddy! These look so tasty and filling. Thanks for the recipe! All of my favorites that I always have stocked in my fridge or pantry. Yum! These look great. I would honestly be a little bit afraid that the sweet potato+cottage cheese might make them more liquid but I guess the egg would hold it together well. I love getting my protein without powder so thanks for sharing! I love me some sweet potato pancakes! I make mine with just sweet potato, eggs, baking powder, and cinnamon or pumpkin pie spice mix. Super easy and they are fabulous. Sometimes I add some banana to the mix, but it’s not necessary. I love how you drizzled your PB. So pretty! I think I did a little jump for joy when I saw this. I have been making different versions of protein pancakes for years all starting with eggs and oatmeal. I have not tried sweet potatoe, but when I was low on groceries I have cleaned out the pantry making pumpkin and pecan protein pancakes just because it was all I had to add to change the flavor of my boring oats and egg pancakes. mmmm pumpkin would be great! I love that you used cottage cheese and egg for protein, over protein powder… I try to do the same in higher protein breakfast ideas. They sound delicious to me!! 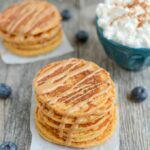 I love sweet potatoes and I love pancakes, so combining two of my favorite things into one sounds like heaven! I’ve been making similar protein pancakes using equal parts egg whites, cottage cheese and oats. Love the addition of the sweet potato. I haven’t tried adding baking soda or powder to them though. Yes please! I want to try these for the kids…thanks for the recipe! i have tried flourless pancakes before and didnt care too much…yours look super good though..
they’re definitely not for everyone! Yum! We always have leftover sweet potatoes, so this would be a great way to use them up. I love cottage cheese but it has so much sodium in it! I wish I could find a brand that wasn’t so high. yeah i definitely always look for the lowest sodium brand! These look great! I love recipes like this that are high in protein without having to add protein powders. These sound really good! It sounds like they might have a texture similar to the banana and egg pancake, which I actually really like! Of course also love how high in protein they are. Perfect start for the day. Or for midday fuel. These look and sound fantastic to me!! This is a weekend breakfast to try soon for sure! These pancakes look really good! I love how you get creative when you run out of groceries. Most people (me included) tend to order take-out when that happens. Are there any staples you keep on hand? i should write an updated pantry staples post! thanks for the idea! These look pretty good- I’ve pinned it so I can try it soon! Yes please! I actually haven’t had cottage cheese in ages. I want to put cottage cheese in everything! Such an underrated ingredient. I made these today and skipped the sweetener altogether. Turned out so light and amazing! The sweetness from the sweet potato was enough for my taste. Also, I appreciate the nutrition info. Will enter it as it is in my MFP account. Has anyone tried making these ahead and freezing them? I’m getting back into the swing of quick before-school breakfasts and would love to have a huge batch of these in the freezer to warm on school mornings. i haven’t tried freezing them yet but please let me know how it works if you do! I love your disclaimers. Can’t wait to try these! how do you get the perfect peanut butter drizzle?? Wow, these are really good! Much better than I was expecting. I thought they’d taste more “healthy.” I love pancakes but feel guilty and sluggish when I indulge. These are guilt-free AND tasty. WIN! Why hasn’t the Gluten Free been talked up or listed to get these out where those searching will find this great recipe? Hi Lindsay! I’m not usually one to comment on changing a recipe – but I would love to make these today and we don’t really eat cottage cheese enough to buy a container but always have greek yogurt on hand. Do you think I could sub? Was intrigued to see that you added rolled oats to the mix, from what I have been told by the celiac society these are not GF, they contain a similar protein to Gluten in wheat flour and many celiacs react to it just like they do to wheat. oat are naturally gluten-free but are often processed in facilities that also process wheat or other gluten-containing foods. to be safe, you should purchase certified gluten-free oats. however it’s also true that oats to bother some celiacs. it varies person to person. That’s my kind of recipe. I love adding more protein in the morning. My boys would eat the whole batch in one sitting!! Cottage cheese is such a great ingredient for pancakes. It blends right in and adds protein. Love the addition of sweet potato. Making and pinning these! 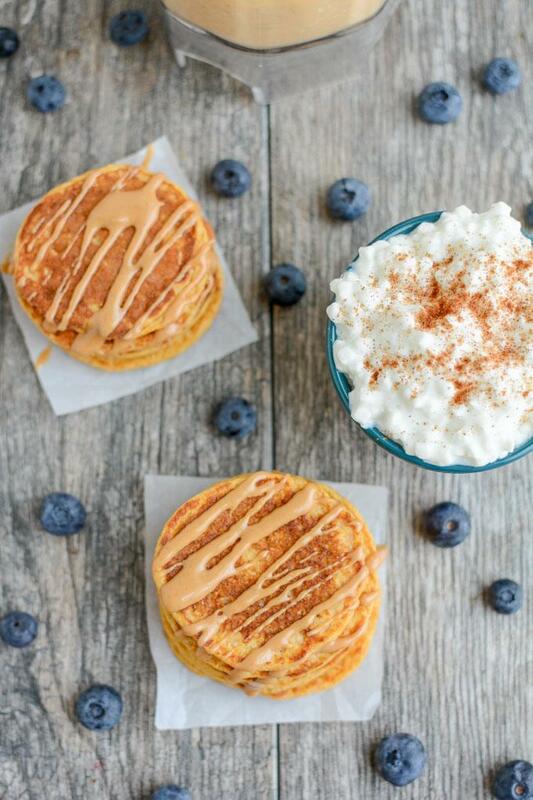 I’d never think to use sweet potato in pancakes – love the idea of using cottage cheese for protein – I was going to try that this morning but didn’t get around to it – can’t wait to try this! Could you use pumpkin instead of sweet potato? Just for convenience sake canned pumpkin. Do they make sweet potato in a can? i think so! I just stab some holes in my sweet potato and microwave it for 5 minutes so it doesn’t take too long. I don’t think so. I think the eggs are pretty crucial in these. hope they were a hit! i’ve used yogurt before and it worked well! Made twice already in a week. Recipe is very flexible. I grind my oats and baking powder first, then add my wet ingredients. Drizzle with sun butter since daycare is nut-free. Thanks for recipe! OMG- I can’t believe how tasty these are! And I really enjoy the texture too. I finally made these and they were a hit with my little boys – yay! My 4 year old doesn’t usually touch sweet potatoes so I will definitely be making these again. Hi, this sounds delicious. I don’t have any cottage cheese. Can I use ricotta instead? haven’t tried it but i assume it would work just fine! My nutritionist sent me a link to your site. I’ve looked at a few of your recipes & I don’t see nutritional information. Do you typically leave this out? It would be helpful to have it. sorry! I don’t calculate that info but you could try putting the recipes into a site like my fitness pal! [WORDPRESS HASHCASH] The comment’s server IP (206.217.196.88) doesn’t match the comment’s URL host IP (184.29.106.19) and so is spam. [WORDPRESS HASHCASH] The comment’s server IP (66.155.8.131) doesn’t match the comment’s URL host IP (76.74.254.123) and so is spam. [WORDPRESS HASHCASH] The comment’s server IP (23.253.151.198) doesn’t match the comment’s URL host IP (23.253.146.121) and so is spam. [WORDPRESS HASHCASH] The comment’s server IP (192.0.118.164) doesn’t match the comment’s URL host IP (192.0.78.12) and so is spam.